This city of 136,633 inhabitants was founded in 1775, received the title of "villa" in 1820 and "ciudad" in 1894. The flag was adopted in 1960. The cross stands for the Cross of San Sebastián, for this was the first Christian village which settled in the Caguas Valley, together with the hermitage of San Sebastián del Barrero.Caguas as in Guayama district, central Puerto Rico. Here is the City Logo of Caguas. It reads: "Caguas, Our New Country, Center... and Heart of Puerto Rico", which is our new motto. This is the official new blue color of the municipal flag as it appears on the city website and its official advertisements. This is to replace the former flag color of dark blue-violet. It has been in place a long time ago, though. The flag is also the city flag. The municipality of Caguas comprises eleven "barrios" or community sectors and each one has its own flag. One of the barrios is the city itself, known as the "Pueblo" barrio or Town (city) barrio. The top flag is same as the image in pueblos-de-puertorico.com site (Not Available at the moment) ; The image made by Thanh-Tâm Le' based upon the Lexjuris image at seems to be an incorrect simplification. That page doesn't seem to give much info on the flag. I located this other version of the flag at <www.geocities.com/Area51/Hollow/2111/mipueblo.htm>. From <www.ngw.nl>: "The arms are a combination of symbols for the two oldest villages in the Caguas valley. The arrows are canting for the village of San Sebastián del Barrero. The symbol of St. Sebastian is a bunch of arrows. The pineapples are canting for the other village, Dulce Nombre de Jesús del Piña." 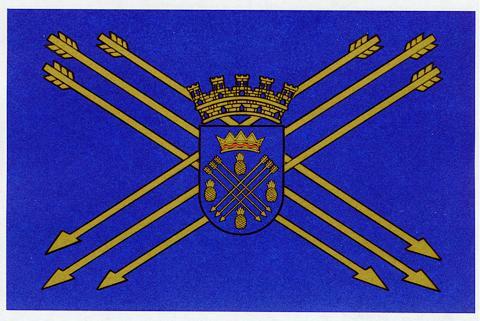 The Assembly of the Municipality of Caguas decided by law long ago that each particular design will be placed as a central shield over crossed arrows, in a design identical to the present Caguas and Bairoa flags. I do not have the information of the background color of this flag. I have all the official shields of each barrio, except San Salvador's, which is at present under a redesigning process. All of them are placed in the central shield. What changes is the color of the flag. At this moment, only the flags of Bairoa, Turabo, and San Antonio are flying, and each was respectivelly introduced in this same order. All the flags of the barrios of Caguas are a modified version of the city flag, with each barrios' shield replacing the central city shield and the field color of a very light shade of either blue, green or cream (this last color not so sure of). Here are small barrios' shields that should go over the flags. The fields will have at least three colors: green, blue and cream, all in very light shades. At last I had the opportunity of talking with my city Mayor and he referred me to the office where I've could finally get the information about the barrios flag symbolisms. It was decided that the background color of the flags should be of these pastel shades (the name was determined by the flag manufacturer): peach, seafoam, blue flower, and buff. The flags are made of 100% nylon and are 3 x 5 -this is contrary to the Municipal Assembly law so I decided to keep them drawn as 2:3. Each barrio flag has the city flag as template, changing the background field color and the central shield. They all were originally designed to be dark blue in color, but it was decided to change the field color to pastel ones, so each one can be discerned from the city flag. The flag manufacturer decided the shade of the specified colors and give them their name. They are as follows: "peach", really a lighter shade; "seafoam", a light blue-green or light turquoise; "blue flower", a very light sky blue; and "buff", meaning literally skin leather, a yellowish tan.